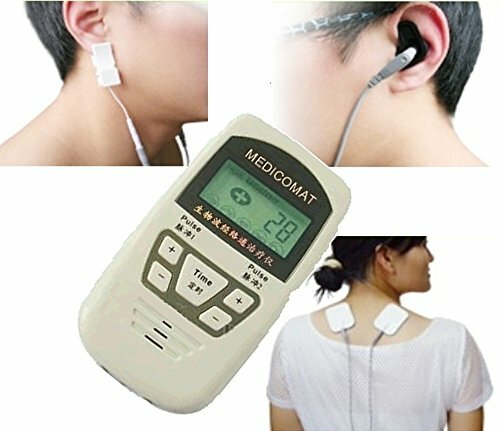 Medicomat-10U is a new device designed to improve sleeping. The micro-computer IC control the time to release output, relieving stress, promote blood circulation, easy dozed and sleep quality. After a period of time use, the sufferer will gradually back to normal new healthy life. Special electrical pulses stimulating sleep-related acupuncture points * Electronic massager comforting the body * Natural biological clock can be trained and maintain if worn regularly * 5 Treatment Modes * Easy to use * Double Effect - the apparatus has two channels for electronic acupuncture massage therapy. You can use them simultaneously and choose two therapies at same time for the better therapeutic effect. Sleep Disorders and Problems * Medicomat ear acupuncture provides a fully automatic treatment for the whole body, complemented by the effects of targeted sleep acupuncture massage through the ear-clip electrode. Fully Automatic Treatment * Auto-selection of acupuncture points * This apparatus employs the unique technique of a electronic Ear- fitting Electrode and a Ear Clip, thus making the operation easy. The user does not need to have any knowledge of acupuncture, and the only action he or she needs to take is the adjustment of the intensity of the pulse according to his or her tolerance.